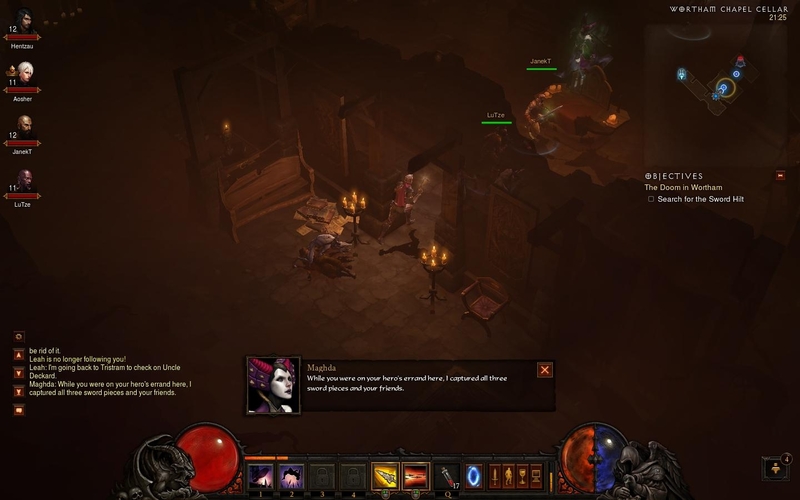 Diablo 3’s plot is astoundingly bad. Staggeringly bad. It’s so bad I’ve spent quite a lot of time trying to figure out how one of the world’s foremost game developers could do this to one of their three flagship titles. I even went back and had a look at the manuals for Diablo and Diablo 2 — these being written in a kinder, gentler age when having 50% of your manual filled with backstory was seen as a requirement rather than a regrettable waste of paper and money – and something that struck me was that the background blurb there was just as poorly-written as Diablo 3, if not more so. Awful plots are clearly not a new thing for Blizzard, and yet it was not something that I particularly noticed when playing through either of the previous Diablo games. Why is this? Well, the answer’s fairly obvious: while the manuals flesh out the backstory to Diablo in all of its hideous glory, almost none of it is mentioned in the games themselves. Maybe Blizzard always wanted to fill the Diablo games with interminably long expository cutscenes that pop up every five minutes and it’s only now that the technology available has allowed them to realise their artistic vision, but no matter the actual reason the fact of the matter is that the first Diablo game basically doesn’t have a plot, while the second chooses to paint what little plot it has in very broad brush strokes that leave plenty to the player’s imagination. There’s almost no detailed background on the Sin War or the Horadrim or the Worldstone or the Prime Evils. There is just you, the player, single-mindedly chasing the Dark Wanderer across the various continents, and everything else is incidental to this. Diablo 2’s plot may be almost non-existent, but I’d argue that it’s actually a very good example of storytelling in a game precisely because it’s very hands-off. It tells the player almost nothing; what exposition you get comes through Deckard Cain and the end of Act cutscenes, which themselves are only indirectly to do with you. The events of Diablo 2 take place in medias res; the cutscenes are a series of flashbacks and flashforwards which relate the story of Marius, an unlucky traveller who got caught up in the Dark Wanderer’s wake. This is a very strong method of telling the game’s story because it sets up the scenario for the player’s actions and it shows you some of the consequences without ever involving the player themselves. The player character is left entirely to the player’s imagination to flesh out; they’re a perfect cipher who doesn’t particularly need a backstory, because whatever class they are they’re pretty much just there to punch a successively larger series of monsters right in the face. The same is true of the villains. 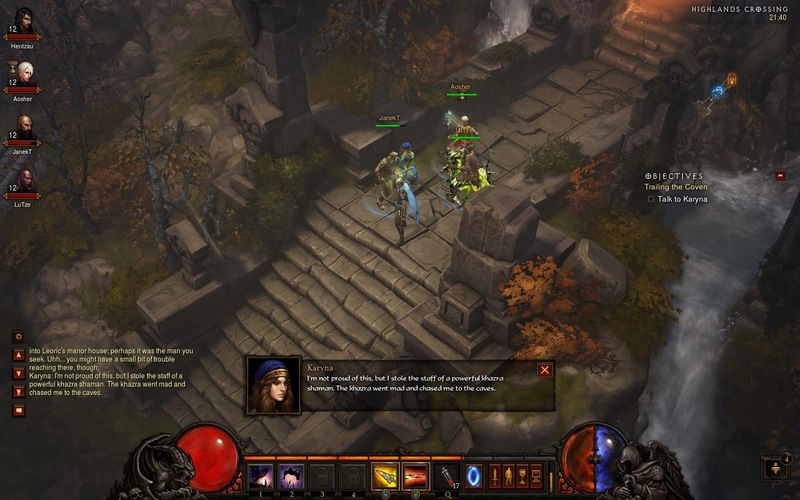 In Diablo 3 the villains are constantly phoning the player up to tell them about the next step in their dastardly plans, thus conveniently letting them know exactly where they should be going and what they should be doing to stop them. They are also completely delusional, reacting to the player’s systematic destruction of their armies with a series of increasingly absurd statements along the lines of “It doesn’t matter! It doesn’t matter! LA LA LA I CAN’T HEAR YOU!”, and when facing you themselves they’re utterly convinced they’re going to win despite you slaughtering your way through literally thousands of baddies to get to them. There are several effective ways to write compelling, threatening villains. This is not one of them. and while it isn’t necessarily the ideal it’s undeniably effective for the sort of game Diablo is. Diablo is not an enemy who needs to posture or threaten; he probably doesn’t even know the player exists until they wander into his keep. He lets his actions do the talking, and since he’ll probably kill you several times on the first go the lasting impression he makes is that he’s a pretty effective final boss. It also helps that, right up until the moment when you kill them, Mephisto and Diablo are winning. 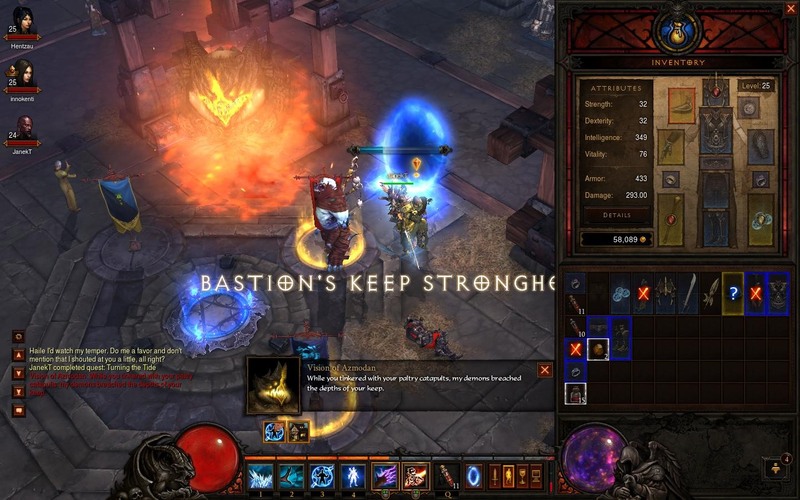 Mephisto has broken free of his prison and successfully corrupted the Zakarum priesthood charged with keeping him confined, while Diablo has physically taken over the body of the hero who vanquished him in the first game and is literally raising Hell as he makes his way across Sanctuary. Until they encounter the player pretty much everything they have done has gone according to plan, making them seem at least competent enough to be leading the infernal legions in their eternal war against Heaven (or whatever). Diablo 3’s Azmodan on the other hand is all talk and no trousers; throughout Act III you’re constantly told what a super-duper awesome general Azmodan is and how he’s won countless victories on the battlefields of Hell, and yet his modus operandi in game – the stuff you as a player see him do – appears to involve repeatedly tipping the player off as to where exactly he’s going to strike next. These are not the actions of a tactical genius. Of course you can’t really have effective villains when you need to make the player character out to be a super-special last-scion-of-an-ancient-bloodline Chosen One. This is what I like to refer to as the Sherlock effect, which I observed in the recent BBC adaptation of the same name. Sherlock Holmes is supposed to possess genius-level powers of deductive reasoning which make even intelligent men like Watson look like chumps in comparison. The conclusion we’re supposed to draw from this isn’t “LOL Watson is dumb” but rather “Man, that Sherlock Holmes is pretty amazing!” In Sherlock, though, it’s the other way round: in order for today’s viewer to understand the plots Sherlock is written to be about as smart as the average person, so the only way they can accentuate his supposed superhuman intelligence is by having every other person on the show act like they’ve been given a pre-frontal lobotomy. So it is with Diablo 3: we’re constantly told that the armies of Hell are unstoppable and that the Evils are a big deal who are not to be trifled with, but in the game they’re portrayed as inept, bumbling buffoons both by their actions and by your victory over them coming so easily. In backstory terms, it came easily because you’re so awesome. In game terms, it came easily because Blizzard wrote the baddies to be incompetent morons. Would Moriarty have been threatening if he kept tripping over his shoelaces every time he tried to kill Holmes? Probably not. The problem with Diablo 3 isn’t too hard to understand when you compare it to its immediate predecessor, then. It’s a game that spends too much time telling you that the world is in peril because these total badass Evils are on the loose, and not enough time showing you the results of said peril. It’s more concerned with backstory and lore than it is tone or atmosphere, and as a result the plot turns out to be a horrible, disjointed, nonsensical mess. The origin of the Nephalem is given far more exposition time than SPOILER’s nefarious scheme and eventual betrayal, which I think is dealt with in about two lines. It’s not that the inherent quality of the story is worse, particularly, it’s that the way it’s told is completely lopsided resulting in a complete tonal shift away from the gothic horror of Diablo 2 and towards an almost Benny Hill-like level of absurdity in the places and characters you meet as you make your way through the game, which is completely wrong for what Diablo is. Or rather, what I think Diablo is supposed to be, and what Diablo has been in the past. I don’t know what it is now. All I know is that I don’t like it. Hit the nail on the head. Act 3 and 4 were especially bad. At least with Belial you could kind of see how he was manipulating you with the other characters. There was a point in Act 2 where I wasn’t sure if the Emperor was bad or Adria just because of the dialog. I’d give them credit for that actually. However, you have perfectly described Act 3 and dealing with Azmodan. If hes the greatest general in all of Hell, I’m not sure why they need a hero at all. Zoltan Kulle is literally the only character in the entire story with a brain, and he seems like a pretty fun guy to boot. Which I suppose made it inevitable that he would be murdered by the player character without ever stopping to find out just what was up with that soulstone. Minor criticism: it should be noted that the Diablo 3 manual is also full of backstory. It is appallingly written, contradicts much of that occurs in the actual game (“Tyrael… [was] no more,” for example, which is odd because he’s pretty abundantly not dead in the actual game itself) and, of course, no-one reads the manual these days anyway – but it feels odd not to have acknowledged that the D3 manual is as much fiction as the D2 and D1 ones were. That’s not a manual. It’s a pamphlet full of fanfiction. I like the D1 and D2 manuals because they have comprehensive equipment breakdowns, spell descriptions, bestiary entires etc. etc. before they ever get to the horrible, horrible background stories. The D3 “manual” by contrast functions as (I guess) a story primer for people who weren’t born when Diablo was released. It’s a sign that the story has moved front and centre rather than being shoved at the back of the manual where it should be. Which may seem like an odd distinction to make, but there you go.